I love macaroni and cheese, the beautiful pasta, coated with a creamy blanket of cheesy indulgence. The crispy top, making way for a melting interior. Whats not to love? Well, some varieties of mac and cheese are plainly unappetising, made from over processed, pasturised ingredients that have all the life and soul taken out of them (once youve seen that orange glow, you will never forget it!). I wanted to make a different kind of macaroni and cheese – a sensuous, indulgent meal, ripe with scent, taste, texture and balance. This macaroni and cheese is slightly wicked, a tad naughty, and very memorable. It can be served at a celebration – birthday, New Years, holidays of every kind – or just because you want to say I love you. Honestly, they will get the message! A dish like this needs to be in part based on thought and consideration, and in part on pure inspiration. So I wandered the O’Gourmet Food Hall to see what might present itself. First under consideration was the pasta. I decided on La Collina Toscana pasta, made in Italy, and rather than macaroni, a conchiglie shape – like a small conch or sea shell. Gorgeous, naturally dried, hand crafted pasta, with a shape that has the same benefits of macaroni (the curved tubular shape catches and holds sauce well), and yet has a more elegant look to it. But of course, I dont want to be proscriptive, so use whichever pasta strikes your fancy! I feel that macaroni and cheese can sometimes be a tad overwhelmingly rich, and I noted some gorgeously fresh organic baby spinach, so I decided to include a surprise nestled in the depths of the pasta – bright clean spinach, sauteed with white onion, and candied, caramelised garlic. I wanted to make the garlic a little differently from the original Ottolenghi recipe I used, and so decided that instead of water, I would use wine! But then, I saw Fre wines – alcohol-removed wine. Yes, honestly! And finally, truffles. I felt that truffles added to the cheese sauce would elevate this dish into a celebratory, special meal. I looked around, and decided to layer the different truffle tastes – starting with the amazingly hedonistic truffle oil from Vom Fass, which I used to permeate everything from the spinach to the garlic to the cheese sauce. 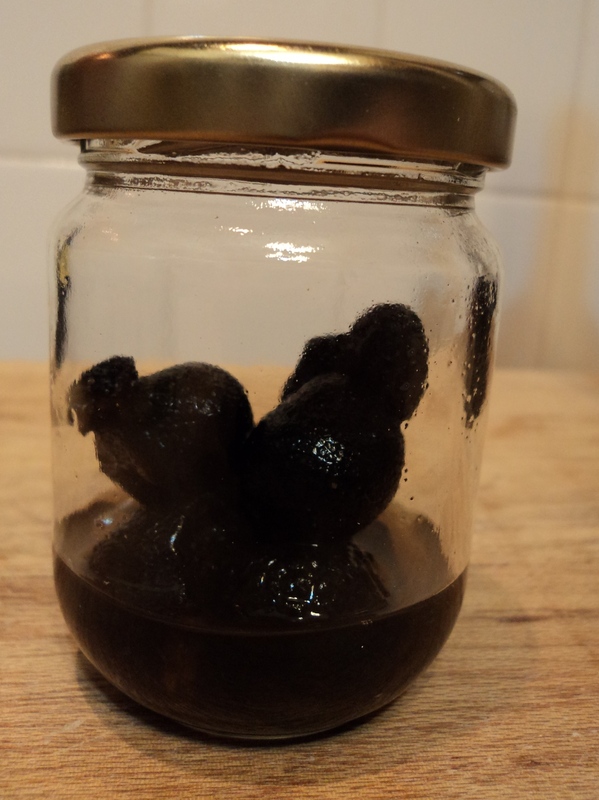 I seasoned everything with truffle sea salt, and finally, I found Himalayan truffles (tuber indicum), an inexpensive (relatively) jar of black truffles from the Himalayas. I loved these truffles. They were easy to work with, and imbued the pasta with their own truffled scent – not quite as all inclusive as European truffles, which seem to have the reach and depth of durian, but with their own nutty, dark, rich flavour. And when I spoke to M. Sebastien in the cheese room, he suggested that I use a Brillat-Savarin (a triple cream, soft, brie-like cheese) which had been layered, and thus completely permeated, with truffles. I used organic white cheddar and a beautiful aged crumbly parmesan as well, but I promise you, when I sliced open that Brillat-Savarin, and saw the thick soft melting consistency, and smelled that unique combination of cheese and truffle… well, I wanted to rub it all over me! Incredibly luxurious and such a beautiful addition to the pasta. This dish looks like a lot of work, and it certainly will take a couple of hours of cooking. But a lot can be done ahead of time – the garlic can be candied and caramelised in about half an hour or so, and can be stored in the fridge for about 2 weeks. The spinach can be sauteed and kept, covered, in the fridge for 3 days. Even the cheese sauce can be made the day before (though I would whisk in the egg at the last minute), and combined with the pasta just before baking. I served the dish with a simple salad of bitter arugula (rocket) and ribboned organic carrots, with a dressing of balsamic, truffle oil and soy sauce. It was a bright counterpoint to the luxury of the main course. This truffled macaroni and cheese is worth the work and the care, the loving sourcing of beautiful ingredients. The result is a gift to the people you love, and to yourself. Combine the red wine and garlic cloves in a medium saucepan. Bring to the boil over medium low heat, and simmer for about 5 minutes. Drain the red wine from the garlic cloves, reserving the red wine for later. Clean the saucepan well and dry it, and place the garlic cloves and the truffle oil into the saucepan together. Saute the garlic in the oil for about 5 minutes or so, on medium high heat, or until the garlic has softened, released its intrinsic garlic scent, and become lightly browned. Measure out about 1 1/2 cups of the red wine, and combine with the sugar, balsamic, herbs and salt. Pour over the garlic in the saucepan. Be careful, because it will splatter a bit. Simmer on medium high heat for about 15 – 20 minutes, or until the liquid has almost completely reduced, and the garlic is dark red, sticky, candied and caramelised. Take off the heat, and pour over the remaining 1 tsp of truffle oil. This candied garlic will keep in the fridge, covered for at least 2 weeks, but you will probably eat it before then! It can be an astonishing addition to salads, soups, risottos, pastas, sandwiches – just about anything you can imagine! In a medium sized pan, over medium heat, combine the 2 tbsp of truffle oil and the white onion. Saute for 5 – 10 minutes, or until the onion goes glossy, soft and shiny. You dont want it to burn, but you do want it to reach that moment just before it caramelises! Season with truffle salt and pepper, and add the baby spinach. Raise the heat a little, and saute quickly. The spinach will turn bright green, and will release some of its liquid. This is perfect. Remove from heat, taste and adjust seasonings, and pour over the final teaspoon of truffle oil. You can reserve this spinach for up to 3 days, covered in the fridge. It also makes a sublime side dish! In a medium large saucepan, combine the cream and milk. Grate over the truffles (I used a Microplane zester to shave the truffles very small and fine), and add the truffle oil and truffle salt, if using. Over low heat, warm the cream/milk/truffle mixture until it is just steaming – about 75C or 165F. Stir often. Once the mixture reaches the steaming stage, remove from heat, and let steep for at least an hour. This infusion step is important! It makes sure that the taste of the truffles is all over that sauce. In a medium large saucepan, melt the butter and truffle oil over medium low heat. Once the butter has melted completely, add the flour, and stir well. This roux will form the basis of your sauce, so make sure that you take your time and cook it well. You want it the colour of light teak – keep your nerve. Dont burn it, but dont let it stay too pale either. I would cook for at least 5 minutes, up to 10, depending on the heat source. Once the roux has cooked to your liking, lower the heat a bit, and add 1 cup of the white wine, whisking constantly. The mixture will immediately seize up and become very thick. Whisk in all of the steeped milk/cream/truffle mixture, and continue to whisk well. Taste. Add the remaining 1 cup of white wine, tasting every 1/4th cup or so. You dont need to add it all if the mixture becomes too heavily winey. Sprinkle over the mustard powder or the Dijon mustard, and whisk well to combine. Bring the heat up to medium low, and sprinkle over the cheddar. Continue whisking the sauce as you incorporate the cheddar into the mix. Taste and adjust seasonings again. Slice the bottom rind off the Brillat Savarin, and using a teaspoon, scoop it out of its rind. Add to the sauce, and whisk well to combine. Sprinkle over the parmesan, and whisk well, until the cheese is melted and well mixed. Remove the sauce from the heat and allow to cool to tepid bathwater heat. Whisk in the egg yolks to enrich the sauce, and adjust for seasoning. The cheese sauce can be made up to a day of time, before adding the egg yolks. Keep tightly covered in the fridge, and bring to room temperature before whisking in the egg yolks and assembling the main dish. This sauce would be wonderful served as is, not baked, with angel hair pasta or linguine! You can serve this in individual small ceramic baking pots, bake it in loaf tins (it will fill three tins), or a large enameled baking dish. Your choice – I think it depends on how and who you are going to serve! Individual pots are a very elegant presentation, but loaf tins or a large baking dish bring a casual luxury to the meal. Preheat the oven to 160C (325F), and have your baking pans ready. Prepare macaroni or other tubular pasta according to the packet directions, in a large saucepan or pot, over high heat, in heavily salted boiling water, but taste a few minutes shy of the time indicated on the packaging. I cooked conchiglie pasta, and the packet said 15 minutes. I cooked it for 11 minutes, to just before al dente. Drain the pasta, and place in a large mixing bowl. Pour over about three quarters of the cheese sauce and stir well to combine. Taste for salt and pepper and adjust. Place about half of the pasta in your baking pots/tin/dish. Press down to ensure that the pasta is snug. Ladle about half of the remaining sauce over the pasta. Using your hands, squeeze out the liquid from the reserved spinach, and place it in an even layer over the pasta, leaving about 1/2 inch rim free around the edge of the dish. Stud the spinach with the caramelised garlic – as much or as little as you wish, though i went easy on it. I wanted a spark of intense flavour, but I did not want to overwhelm the delicacy of the pasta. Add the rest of the pasta to the dish, and ladle over the remaining sauce. In a small bowl, mix together the Italian parsley, breadcrumbs and parmesan, and sprinkle evenly over the pasta. Bake in the oven for 45 minutes to an hour, or until the pasta is bubbling and hot, and a crisp, golden crust has formed. Just before serving, sprinkle lightly with the truffle oil to really bring out the scent.